Las Vegas, NV — Audinate, developer of the industry-leading Dante® media networking technology, announced today that its revolutionary Dante Domain Manager Platform is now commercially available through a global network of authorized resellers. 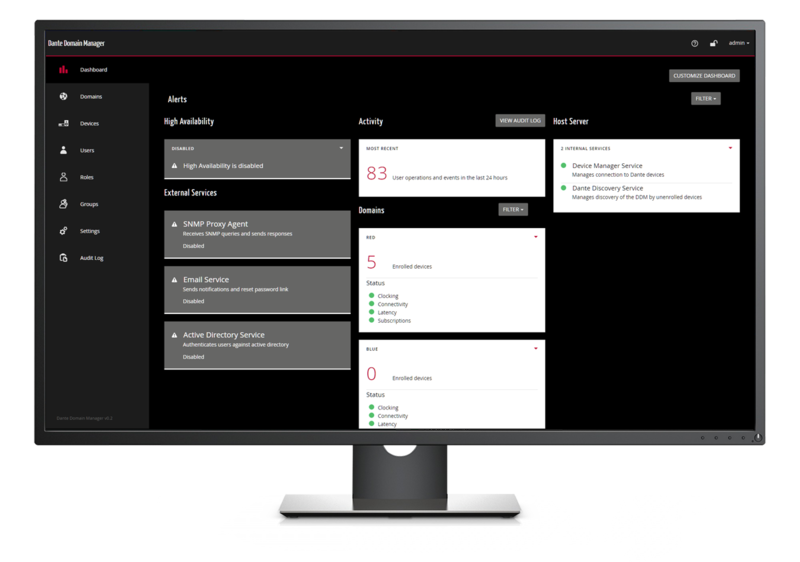 Dante Domain Manager is Audinate’s new, award-winning network management solution that brings enterprise-grade system administration to the AV world and makes audio networking more secure, scalable and manageable than ever before. This game-changing technology provides AV and IT professionals with the ability to define specific AV device groupings by room, building and site, through the creation of independent Dante Domains. Each domain has multiple access levels to improve network security, and enables scalability by allowing audio routing across multiple IP subnets. The network domain concept was first pioneered by the IT industry to differentiate and manage multiple private networks within the same infrastructure. Audinate is applying this same approach to AV, while customizing the features to the needs of AV professionals and end-users. The Silver edition is listed at $995 USD and is ideal for installations that primarily require user management, such as smaller houses of worship or schools, with a maximum of two domains and 10 audio devices. The Gold edition is listed at $3,995 USD and includes integration with Active Directory and is suited for many mid-sized business environments, supporting up to 10 domains and 50 devices. Audinate will showcase Dante Domain Manager at the annual NAB show in Las Vegas April 7-12. NAB show attendees are encouraged to visit Audinate at Booth N4511. For more information on Dante Domain Manager or to find a global authorized reseller, please visit Audinate.com/DDM. Based on industry standards, Audinate created Dante, an uncompressed, multichannel digital media networking technology, with near-zero latency and synchronization. Dante is the preferred audio networking solution that has been adopted by more pro-audio AV manufacturers than any other networking technology. Interoperability is not a dream of the future, but a reality today. Over 1,250 Dante-enabled products are available from the world’s leading manufacturers, enabling you to mix devices from multiple manufacturers. Dante and Audinate are registered trademarks of Audinate Group Ltd.